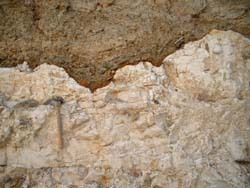 St.Peters Quarry is an old chalk pit situated in the middle of St.Peters village in Thanet.Three of the quarry walls have been bricked up, but the last remaining wall is intact and shows the unconformity between the eroded surface of the upper chalk and the Thanet Sands. The exposure is almost 30metres in length. 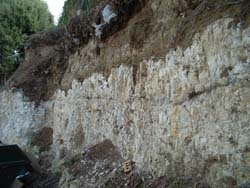 The St.Peters chalk, which is solid, normally fractured and clean right up to the contact, is recorded as being from the Offasta pilula zone. The site is therefore the highest level of chalk exposed in the South East. The site is within a residential area, parking available on Poplar Road. The flats are now occupied and the quarry face can be seen from the flats car park. 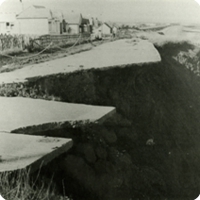 The quarry face has shown little historic movement.